Close to both The Ancient Barn and The Old Stables, surrounded by nature is a small medieval bee house (where the bee skeps were kept in winter). 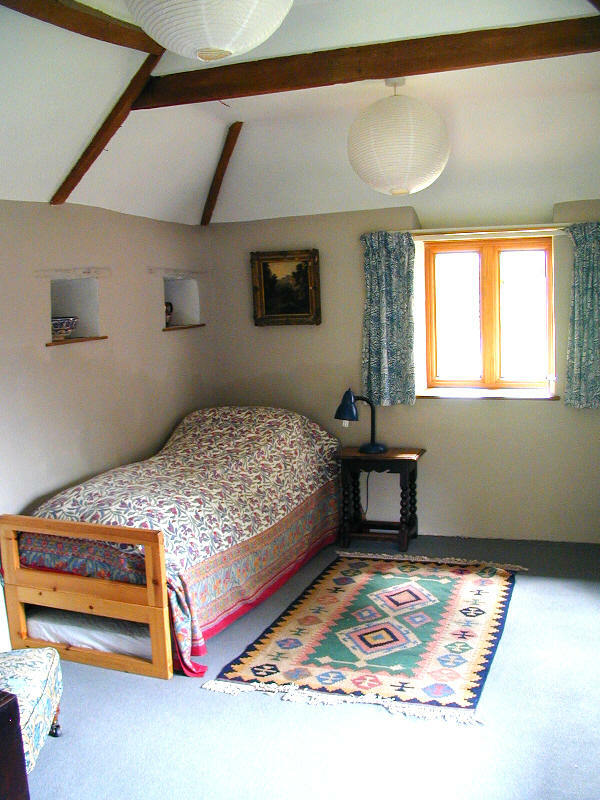 This has been converted to provide an additional cosy bedroom (sleeps 1-2) that can be rented in conjunction with either The Ancient Barn or The Old Stables – both are close by. It has a single bed (folds out to make a double), a desk over drawers, table and chair. TV and basic tea/coffee making things are also provided. 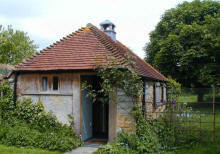 The bee house has its own small shower room (shower, basin and WC). Linen is supplied and also central heating in winter. Each subsequent night £30 per person per night. Please note: the Bee House cannot be rented on its own – it has no cooking facilities. This accommodation is very quiet and is ideal for a family member who perhaps needs to be able to retreat from the perpetual bustle of family life!